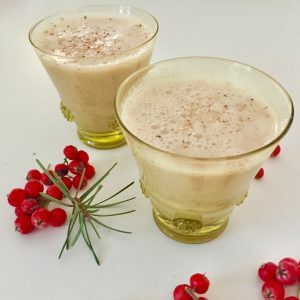 Though we genuinely love Mom’s holiday eggnog as a wildly decadent dessert on Christmas Eve, we have been hankering for a NOG recipe that we could consume more frequently without turning into Miss Clause! So, here it is. This recipe is packed with all the deliciousness of true eggnog….without all the eggs and whippin’ cream. Want to liven up your cereal in the morning? Kick up your chai latte? Douse your cappuccino? The possibilities abound. For a chocolate nog, blend a spoonful of cacao powder to this recipe using a mini- frother or blender. This recipe may not be as rich, nor as decadent as the dairy-ladened “Full Monty” version( also on our website), but it is supremely sippable and no doubt, a more heart conscious choice. Place the strained nut milk in the blender with the pitted dates, vanilla extract, and a pinch of cinnamon, grated nutmeg and cardamom, if using. Season to taste with the rum. Note: We like to use those wonderfully soft Medjool dates, but if you can’t find them or the dates are hard, you may need to hydrate them first to soften them so they will fully incorporate into the nut nog. You could always strain the nut nog before placing it in the refrigerator if your blender doesn’t fully blend the dates. Note: We recommend soaking the nuts for 4-6 hours or overnight. Soaking the nuts makes them more digestible, as most nuts have enzyme inhibitors that prevent out bodies from getting the maximum nutritional benefit. This being said, we have been in a hurry on many occasions and bagged the soaking process. Do what suits you and your lifestyle! Note: Feel free to mix and match with the alcohols. The combo of bourbon, brandy, and rum is also delicious and a splash of Frangelico would be nice as well. Hazelnuts and Heart Health. Did you know that…. Hazelnuts have been deemed the most beneficial nut for heart health, containing a mix of beneficial compounds that protect against coronary disease? They also help to lower cholesterol and blood pressure, so cheers to the NUT NOG!! !